News related to PSI Process & Equipment / Pumping Services, Inc.
We are pleased to announce that Ryan Booth has joined PSI as a Sales Engineer. Ryan will work with the Municipal Sales Team supporting the application of pumps and process equipment to the market in New Jersey. Ryan has worked at Xylem Inc. for 12 years - as a Branch Manager and Sales Engineer for Godwin Pumps. Ryan is a graduate from the United States Military Academy, West Point, New York, and served our Country with the United States Army for 11 years. Ryan served as a Tank Platoon Leader, Scout Platoon Leader, Troop Executive Officer, and a Rear Detachment Commander in the Division Cavalry Squadron. He was awarded the Bronze Star Medal for Valor during combat operations in An Najaf, Iraq. TIGG announces receipt of NSF® International certification for its large vessel CP line of liquid phase products, for compliance with NSF®/ANSI 61 and 372 - Drinking Water System Components - Health Effects and Lead Content. TIGG’s ASME code stamped filtration tank systems can contain 20,000 - 80,000 lbs. of activated carbon with flow rates ranging up to 1,500 gpm. The mayor and council of Kearny, N.J., created the Kearny Municipal Utilities Authority (KMUA) in May 1988. KMUA is responsible for the collection of wastewater from portions of the Meadowlands and South Kearny sections of the town. It also is responsible for screening solids from the wastewater and pumping it to the Passaic Valley Sewerage Commission (PVSC) in Newark, N.J., for final treatment. KMUA maintains one 17.5-mgd pumping station in South Kearny–the Kearny Point Pump Station—and three smaller pumping stations in the Kearny Meadowlands. The Kearny Point Pump Station was outfitted with four Flygt dry pumps in the early 1990s. 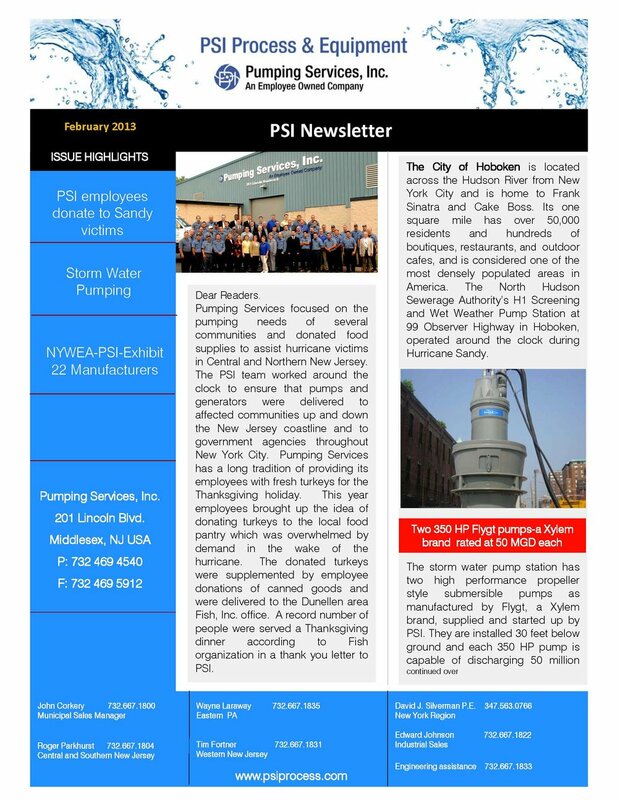 Pumping Services, Inc. has been appointed by IBS Group as Distributor/Representative and Service Center for the New Jersey, New York City and surrounding areas. IBS Technics GmbH provides mobile flood-defense walls to protect people living anywhere in the world. The IBS Group has carved out an outstanding reputation as a solution provider for over 20 years for providing flood defense systems to protect critical infrastructure. Pumping Services, Inc., with its PSI Process and Equipment and Instrumentation Technology Systems (ITS) divisions continues to grow on its path to becoming the leading supplier of stormwater and wastewater treatment equipment in this area by providing highly efficient water technologies with high quality performance, from the leading manufacturers of pumps, and water treatment processes now including IBS Group. 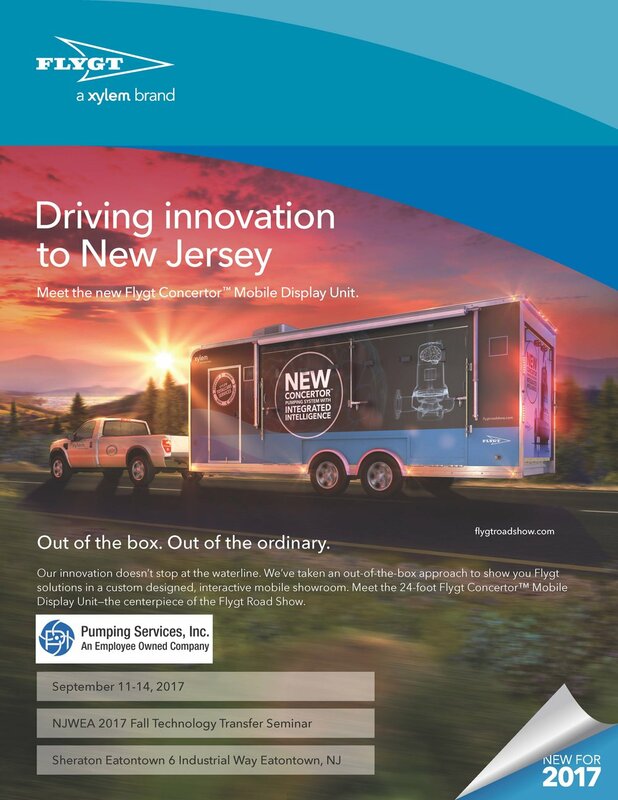 Franklin Miller, Inc. Appoints Pumping Services, Inc. as authorized distributor and service center for New Jersey and Metro New York City areas. Franklin Miller Inc. for 100 years and three generations has been a leader in size reduction technology involving crushers, shredders, grinders, wastewater treatment systems and more. Today Franklin Miller broad line of processors covers many aspects for wastewater treatment. The unique combination of experience in solids processing has made Franklin Miller uniquely capable of solving many difficult customer process problems. Upholding a 100 year tradition of quality, each Franklin Miller processor or size reduction system is built to exacting standards and then subjected to a rigorous inspection and testing process. With a Franklin Miller processor you are assured the finest and commitment to leadership starts with extensive engineering, research and development. 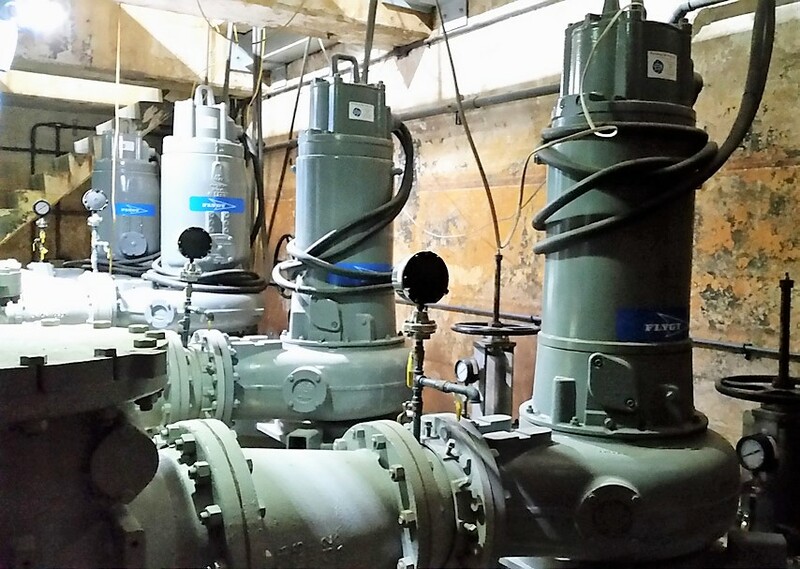 According to Rich Malt, Service Manager for Pumping Services’ Service Group, the appointment is in response to our customers’ needs for high quality grinders for solids reduction in wastewater systems, along with prompt and reliable service all from one single supplier source. This results in faster turn around and saves on service and maintenance costs. "We can now provide single source responsibility for pumping, grinders, process equipment, integrated control and SCADA systems, which are supported by the best design, engineering, project management, and the 24/7 capabilities of our field service group for support and training"
This isn’t your average truck and trailer. The Flygt Road Show is a unique showcase of the industry’s leading wastewater solutions. Bringing both products and experts to you, it’s an up-close experience with the technology that can make your municipal wastewater applications more effective and efficient. Xylem introduces an exclusive breakthrough in wastewater pumping! The new Quantum Disk Filter from Nova Water Technologies, delivered to a New Jersey Water Company, eliminates rubber seals, roller chain and sprockets, internal bushings and bearings for less maintenance. Glasco UV systems are designed for municipal water and wastewater disinfection, TOC reduction, Ozone destruction, liquid sugar, chlorine destruction, chloramine destruction and many applications serving residential, commercial, industrial markets. Instrumentation Technology Systems Inc. (ITS) joins with Pumping Services, Inc.
Instrumentation Technology Systems (ITS) founded in 1980, and based in Rahway, provides custom controls design, programmable logic controller programming, system integration, and has built a reputation in the industry as an established integrator for control systems and field service. ITS will move to the Pumping Services facility later in 2015. Announcing Phoenix Process Equipment Company and United Blower Inc.
Phoenix Process Equipment Company, a supplier of sludge dewatering equipment. United Blower Inc. a supplier of quality positive displacement, Turbo, regenerative, and sliding vane blowers. Experts Agree that Headworks is the Right Choice! Headworks International prides itself on quality construction, innovative design, and low lifecycle cost. In this panel discussion, learn more about the company’s MBBR/IFAS solutions and well known Bar Screens from people who use and specify them. Because Hoboken, NJ, is among the most densely populated cities in the United States, space was limited for the new wetweather pumping station. The slim profiles of Flygt’s submersible pumps facilitated installation in extremely tight quarters. What is a Pressurized Sewerage System? Jefferson Parish, Louisiana extends along a 15-mile wide corridor west of and upriver from New Orleans. The Parish is vulnerable to tropical storms and hurricanes from June through November in a region already known for high rainfall events throughout the year. To make matters worse, the structural and operational integrity of the sanitary sewer lines and pump stations are compromised by age and very minimal budgets to maintain the equipment in place. What is Arc Flash? ARC ARMOR from CSI Controls Inc.
Pumping Services is an environmental company in more ways than one. We are committed to minimizing the environmental impact of our business and promoting environmentally friendly technology which benefits our customers and our community. Therefore it is with great pleasure that we are announcing the completion of a 195.795 kW photovoltaic solar installation on the roof of our facility. This installation will provide more than 70% of our electric needs and is a concrete symbol of our commitment to a better planet. Pumping Services worked with Solar Energy is Power, Inc. from East Stroudsburg, PA to complete this project which utilized 687 285-Watt solar panels and 21 inverters. We anticipate that this project will continue to produce environmentally friendly power for more than 25 years.